Funeral for Karlie and Khandalyce was held today. 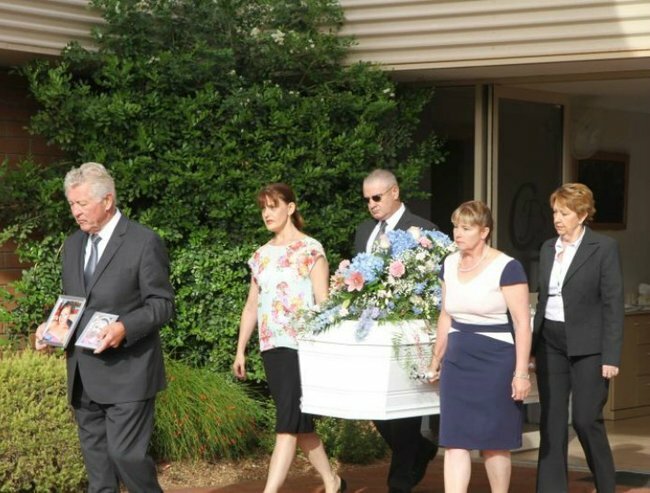 Funeral held for slain mum and daughter in Alice Springs. More than a hundred mourners gathered at the Alice Springs Desert Church for the private farewell for the pair. The remains of Ms Pearce-Stevenson were found in the Belanglo Forest in NSW five years ago, while her daughter’s remains were found along with a suitcase on the side of South Australia’s Karoonda Highway in July this year. A group of people in Alice Springs released dozens of pink and blue balloons outside the church at the conclusion of the service. The mother and daughter were buried together in a small white coffin at a local cemetery, next to Ms Pearce-Stevenson’s mother Colleen Povey, who died in 2012. Prior to the service the family released a statement acknowledging the outpouring of support they received from the wider community. The statement quoted celebrant Meredith Campbell. “The love and support offered by all those good people who assisted the family through these dark and unforgiving years will never be forgotten,” Ms Campbell said. The family statement went on to describe the mother and daughter. “Karlie was remembered as a cheeky, kind and loyal young woman, who was always there to support family,” it said. The statement said Khandalyce and her mother were “always there, front and centre” and that the pair were “facing the world with all its charms, persuasions and pitfalls”. The discovery of the remains Khandalyce shocked the country and led to a large-scale police investigation to try and work out her identity. She was only identified in October this year, after a tip-off to police. Daniel Holdom, 41, has been charged with murdering Karlie Pearce Stevenson. No charges have yet been laid over the death of her daughter.